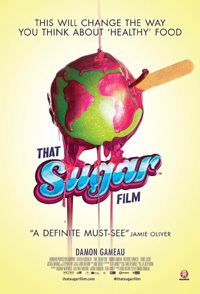 The documentary Fed Up was quite an eye opener when it came to the role sugar plays in the modern diet. But where that film covered a broader terrain, here Australian actor Damon Gameau hones in on that very element many have deemed a legal poison: Sugar. With a baby on the way, his concern for the child's well-being in an ever overwhelming future world, leads to Gameau deciding to adopt the Super-Size Me principle Morgan Spurlock had utilized so effectively with fast-food, only here, the focus being on sugar. He goes on a diet journey to only consume food that poses as being "healthy", but is in fact loaded with sugars (blatant and hidden). The results are quite shocking. This sweet addictive "food" is crammed into everything, and unless you study the label, could be in for a rough ride. Obesity, diabetes and other nutritional disasters are increasing, not dropping. Here scientific facts are illustrated in amusing and fun ways, incorporating well known people like Hugh Jackman, Stephen Fry, and CGI. Gameau's journey includes a trip to the outback where an Aboriginal community decided to eliminate the influx of sugary drinks and other junk. Some shocking illustrations on his trip to the USA is the Mountain Dew addiction in the South, and how people hardly in their 20s consume litres of it daily, their teeth destroyed. Where it hit home in many ways, I feel the attempt to be quirky, funny and somewhat off-the-wall falls flat at the end with Gameau doing tongue-in-cheek pop-song-music-video to a pretty bad result - removing him from the regular guy investigating this everyday hidden danger, to someone who may want to become even more of a focus than the issue at hand (but then, he is an actor…). It annoyed me and failed to hit the message home with a bang - but then, that's just me, you may find it cool and hilarious. I love my sweet stuff, but have made a conscious effort to cut it out, the last few years using Stevia in my coffee and recently starting to make my own sugar-free chocolate - not revolutionary, but a start.